I’ve known about Rachel Windsor-Knott for a while as a social media contact, and several friends and colleagues whose opinions I value had heard her give talks and workshops, so I decided to invite her to give a day workshop for our clients. I knew I was going to like Rachel – especially when she posted about her distraction from her admin day accompanied by photos of her rolling down a hill – only a really fun person would share such photos!! We had a deliberately small group of spectators, two travelling from Swansea and two from near Portsmouth (that’s how good Rachel is!) and three demo dogs for Rachel to work with during the day. Rachel began by explaining a little about botanical self healing (also known as applied zoopharmacognosy – zoo (animal) pharma (medication) cognosy (knowledge) in case you wondered!). In summary, our animals retain the knowledge and ability to choose substances to enhance their health and well being, and will do so, given the opportunity. We all had the chance to smell some oils and describe our responses – they were surprisingly varied, which made us all think hard about the different effects we experienced. Our three demo dogs went on to confirm the ability to self select very clearly! Obviously the demonstrations were not as comprehensive as if Rachel were working with the dogs in their normal home environment, and I wondered if being in such a strange environment might make them less confident in working with Rachel. Certainly not! We began with Flossy, who has NEVER seen so many people in one place, nor been in a village hall. She went and greeted everyone watching, and immediately honed in on some substances Rachel had laid out. Flossy is used to having food and herb choices, so the idea was not unfamiliar to her. She chose two calming, grounding oils and spirulina. It didn’t take long for her to just take herself off and relax, which was very, very surprising in such an unfamiliar environment! Max was the second dog, who is a fascinating dog (well, they all are, aren’t they? But he really is especially!). He picked his human guardian to help him in Turkey, and now lives with her in this country. Max picked many substances, and was very very deliberate in his choices, and pondered the effects before moving on to the next. He picked mainly substances for emotional and physical pain on this occasion, and Rachel pointed out to us that an animal will pick what they need in that moment, so their choices may change day to day. Finally Rachel worked with Charley, who is a big growing adolescent girl! As Rachel said, she was SO clear about what she wanted, Rachel could have left her to her own devices !! Interestingly for a fast growing large breed dog, she chose substances to help with inflammation in the gut and joints. And particularly interesting as we know she has had a lot of gut problems and fierce treatments due to a parasite which seems increasingly common today, and her super guardians are working really hard with her nutrition to heal her guts. 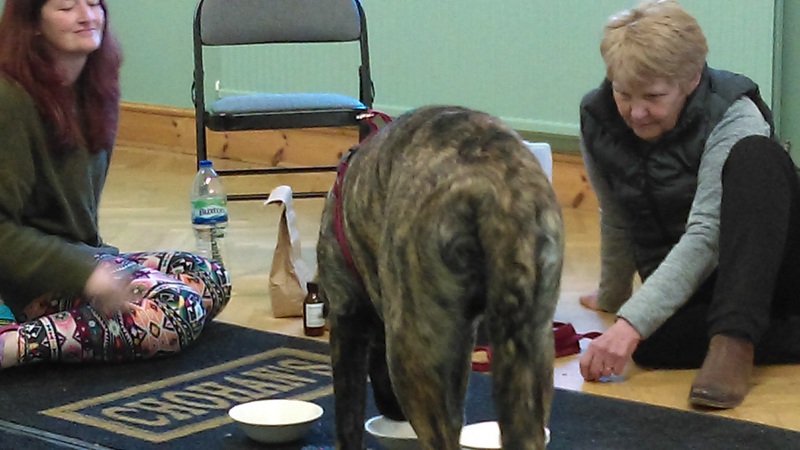 We had such a lovely group of people, everyone respected the demo dogs’ space and wishes, everyone chatted and shared their own experiences (one participant was a human clinical aromatherapist, so she made some great contributions to the discussion). The atmosphere for a day of learning was so relaxed and friendly, perfect! 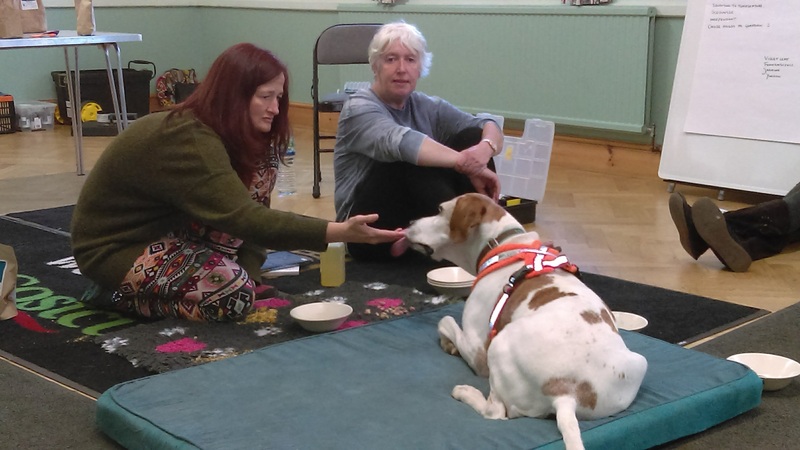 Rachel is a super teacher, passionate about her subject and so approachable and supportive of the dogs. We will definitely be inviting her back, so please let us know if you would be interested in attending her next local workshop (we are currently organising a day with horses). The quote of the day was from one of our gentlemen – “I no longer believe this is a load of rubbish” (this is the polite version!! ), so for anyone who may not be convinced our dogs know what they need, do give it a try! If you’re interested in any of our events, keep an eye on our ‘Events’ page HERE or let us know that you’d like to sign up to our mailing list to receive the latest news HERE. Rachel’s website is http://www.myanimalmatters.co.uk/ if you would like to learn more immediately!